Over the course of seven weeks in 1904, journalist Upton Sinclair entered Chicago's meatpacking industry and worked undercover as a factory operative. The next year his resultant exposé, The Jungle, was serialised in the newspaper Appeal to Reason; in February of 1906, it was released in book form and became an instant bestseller. Shortly after its explosive release, and due in no small part to the public's disgusted reaction to the situation, a series of letters were shared between Sinclair and then-U.S. President Theodore Roosevelt. Below is the first of Sinclair's, in which he advises Roosevelt on the best way for any federal inspectors to approach the factories: in disguise. Sinclair did eventually meet Roosevelt at the White House, and his muckraking ultimately resulted in the implementation of both the Meat Inspection Act of 1906, and the Pure Food and Drug Act of the same year. Transcript follows. 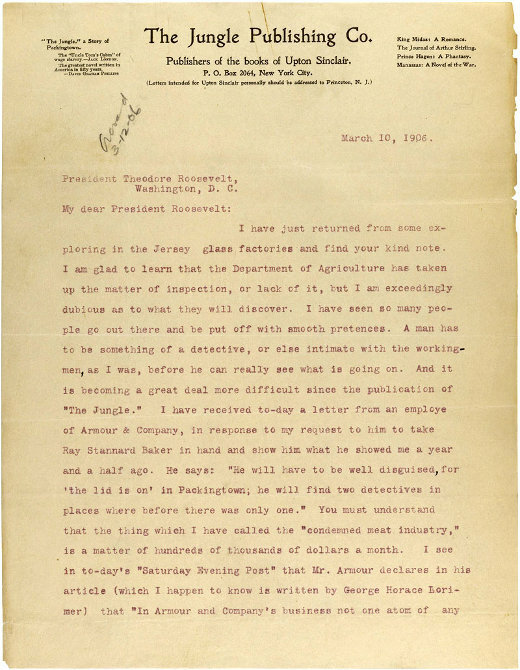 Scans of the letter's remaining six pages can be found at the National Archives. P. O. Box 2064, New York City. "With a special conductor, Mr. B. J. Mullaney, provided for me by Mr. Urion, attorney for Armour interests, I went through the Armour plant again. Mullaney introduced me to T. J. Conners, Manager, who called Mr. Hull, Superintendent of beef plant and said to him: 'I have just told Mr. McKee that we have nothing here to conceal and that he can see anything he wants and can stay as long as he likes. Please see that my promise is made good. ' I expressed my desire to investigate two points, 1st, the system of inspection; 2nd, the by-product food industry.."
"I saw six hogs hung in line which had been condemned. A truck loaded with chopped up condemned hogs was in my presence (I followed it) placed in one of the tanks from which lard comes. I asked particularly about this and the inspector together with Mr. Hull stated that lard and fertilizer would be the product from that tank. The tanks are in a long room. The East side is lined with tanks for manufacture of lard and fertilizer; the West side with tanks whose product is grease and fertilizer. The grease is for soap, lubricator, etc. Here is a clear infraction of the law, because it requires that such condemned meat be mixed with sufficient offal to destroy it as food. This seems to be done on the 'Grease' line of tanks; it is not done at the 'Lard' line of tanks. See Department of Agriculture Rules, June 27, 1904, Article IX. The excuse probably is that the inspector has not found the animal unfit for one kind of human food, to wit - lard." "Of the six condemned hogs referred to two were afflicted with cholers, the skin being red as blood and the legs scabbed; three were marked 'tubercular, ' though they appeared normal to a layman, the sixth had an ulcer in its side which was apparent. Two men were engaged in chopping up hogs from this line. The truck load prepared while I stood there was deposited in a lard tank. I asked particularly about the line of demarcation between the carcasses used for lard and carcasses used for grease. No explanation was given by either the inspector or my conductor. 'It all depends on how bad he is, ' was the answer. I gathered the impression, however, that not very many carcasses were placed in Grease tanks." So much for Mr. McKee. For myself, I was escorted through Packingtown by a young lawyer who was brought up in the district, had worked as a boy in Armour's plant, and knew more or less intimately every foreman, "spotter," and watchman about the place. I saw with my own eyes hams, which had spoiled in pickle, being pumped full of chemicals to destroy the odor. I saw waste ends of smoked beef stored in barrels in a cellar, in a condition of filth which I could not describe in a letter. I saw rooms in which sausage meat was stored, with poisoned rats lying about, and the dung of rats covering them. I saw hogs which had died of cholera in shipment, being loaded into box cars to be taken to a place called Globe, in Indiana, to be rendered into lard. Finally, I found a physician, Dr. William K. Jaques, 4316 Woodland avenue, Chicago, who holds the chair of bacteriology in the Illinois State University, and was in charge of the city inspection of meat during 1902-3, who told me he had seen beef carcasses, bearing the inspectors' tags of condemnation, left upon open platforms and carted away at night, to be sold in the city. I quote a few words from Dr. Jaques' statement, furnished to Mr. McKee, and would add that he has written an article which will appear in the "World's Work" for May, and of which a proof could possibly be furnished you, if you cared to see it. "My education as a physician teaches me that disease follows the same law whether in animals or human beings. An accurate post mortem requires close inspection of all the internal organs together with the use of the microscope before a physician can say there is no disease present. How many post mortems could the most expert physician make in a day? Ten would be a big day's work; fifty would tax the endurance of the most strenuous. It is reported that one hundred and fifty thousand animals have been received at the Union Stockyards in a single day. How many animal pathologists are employed by the government who are capable of making a reliable post mortem and saying that an animal is not diseased? In round numbers, say there are fifty ?? a few more or less, for the sake of illustration, are not material. Say there are only fifty thousand animals killed a day at the stock yards. This would be a thousand to each inspector, a hundred an hour, nearly two a minute. What is such inspection as this worth? It is true, there is some inspection that is well done; it is that which is done for the sharp eyes of the foreigner." "Inspection to be effective should include the entire twenty-four hours. Federal inspection is probably effective in day light. City inspectors work during city hall hours. The railroads and express companies bring animals into the city every hour in the day. When John Dyson has access to every room in the packing houses and knows what is done there every hour in the twenty-four; when his army of inspectors know the disposition of the meat brought into the city by more than thirty railroads; when he knows the destination and use of the refuse which the meat and liver wagons gather after nightfall from Fulton market, south Water street and other markets; when he knows the meat that comes to the city by wagon and other ways, then, in my estimation, he can give something like an accurate estimation of the amount of diseased, putrid meat that is converted into meat in Chicago. Until he has this information, he must confess to the ignorance of which he accuses others. No one has this information. There are a hundred streets and avenues by which diseased meat can enter the city and be put on sale in the markets. The public has made no effort to find out and it is left to the men who deal in this merchandise to dump what they please into the stomachs of the blissfully ignorant public. Neither do any of us know how much disease and suffering this food causes. The diagnosis of the best physicians is so often turned down at the post mortem table that the actual results of diseased food are difficult to ascertain." Finally, I might add that I have a long affidavit from a man named Thomas F. Dolan, now at the head of the Boston and Maine News Bureau, who was for many years a superintendent in Armour's plant, and has letters to show that he was considered by Armour as the best man he ever employed. He makes oath to Armour's custom of taking condemned meat out of the bottoms of the tanks, into which they had been dropped with the idea of rendering them into fertilizer. It seems that the tanks are, or were then, built with a false bottom, which lets down on a hinge; and that when you stand at the top and see the meat dropped in, you are flooded by blinding clouds of steam which pour up from a pipe down in the tank. When this affidavit was published, Dolan was paid $5, 000 by Armour to make another one contradicting himself. He took the $5, 000 and went on to give away the whole story, which was published in the "Evening Journal," March I6, 1899. The fact that it is a Hearst story would tend to discredit it; but having investigated the whole thing, and met every man who was concerned in the expos?, I am convinced that the affidavit is worth attention. Baker knows intimately a man who is high in the counsels of Armour and Company, and was present at a conference in which Ogden Armour personally gave the decision to bribe Dolan. This is a very long letter, but I feel the importance of the subject excuses it. It would give me great pleasure to come down to Washington to see you at any time, but I would rather it was after you had read "The Jungle," because I have put a good deal of myself into that. P. S. I might add that when I was in Chicago I learned a good deal about the connections which the packers have in Washington, so that I think it most likely that before the Department of Agriculture got anybody started for the purpose of investigating Packingtown, word had been sent there to the packing-houses that things should be cleaned up. I know positively that this was done in the case of Major Seaman, who went out there for "Collier's Weekly."